We review the best SD memory cards for use in your digital / DSLR camera, to help you choose the memory card that is right for you. Our top picks include SanDisk Extreme Pro, PNY Elite Performance, Lexar Professional, Kingston, Transcend, Polaroid and more. Along with the reviews are the specs and details behind the cards to explain the technology and what separates the best flash memory cards from the rest. If you want to learn more, look for our upcoming article “What Are SD Flash Memory Cards – A Guide To Understanding Classes, Speeds and More” or just sign up for our daily newsletter to get it sent straight to your in-box as soon as it’s published. 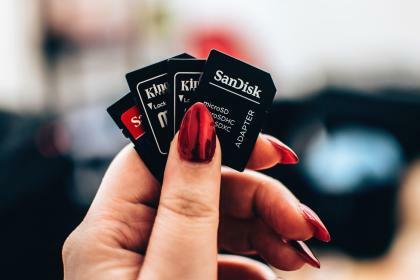 Aside from price, the top features to look for in SD cards are: Reliability, Capacity, Write Speed, Read Speed, Durability, Warranty and Backup / Recovery. Reliability – Whether your are professional photographer, or taking vacation photos, or just pictures of your kids in the park it’s likely that you one get once chance to take the picture before the moment is gone. And after taking hundreds or thousands of pictures, you want to be able to read them off the card. For a moment consider the cost of your camera equipment, the cost of the vacation or just priceless event you want to capture. Reliability is the number one thing to consider when weighed against these factors. Capacity – Do you like to have a couple of memory cards you can swap out and save for each vacation or special occasion, or do you give a SD card to clients? You may want to have bunch of lower GB capacity cards for that use. Would you rather have just one card that lives in your camera, and you never have to have anxiety about it filling up? Write Speed – No one wants to have to wait when they want to take a picture, or a second picture or a fifth picture. The memory card should be faster at writing to the card than your camera is at generating image data. If the card is slower, than you can’t take that next photo until it’s done saving the current one. Read Speed – When you want to see the saved pictures on the camera LCD, you don’t want to have to wait for them to load as you scroll through. You also want to be able to quickly transfer the photos from the card to your laptop or cloud back-up as quickly as possible. Durability – Flash memory cards have no moving parts, no batteries and are pretty much a postage stamp sized piece of plastic. You expect them to be able to keep working if you drop them in the sand at the beach, the dirt on the hiking trail or in the pool. They should be able to survive getting tossed around in your camera bag, purse or backpack. Warranty – If it stops working for any reason, the manufacturer should give you a refund or replacement. After all, these cards are pretty rugged and it shouldn’t be on you if it has a problem. Backup / Recovery – A nice bonus is free cloud storage of your files so that if you ever lose the card, or it does quit working, you can easily get all your pictures. Recovery software allows you to find and restore accidentally deleted files on the card (this works as long as the memory area has already been over written with new images or files). Now that we have the selection criteria, here are the card reviews. Let’s start with Reliability. I’ve used SanDisk cards for many years and have never had one fail on me. This latest series is no exception, and I’m confident to have them in my cameras. I’ll jump to durability: these are shock-proof, temperature-proof, waterproof, and x-ray-proof.This means they can survive all the g-forces and stresses of being bumped around and dropped. You’ll most likely drop-over due to weather before your card does since these can withstand temperatures ranging from –13 ºF to 185 ºF. As for water, it’s rated to survive up to 72 hours in 1 meter of salt or fresh water. And no worries about the X-Ray scanners at the airport, which these can go through as many times as you pass the security lines. Write / Read – For the technical specs Writing and Reading: These are SDHC / SDXC, UHS-I, Speed Class 10, Video Speed Class 30. Here’s what that means, and what real world Write and Read testing showed. The “SDHC” (High Capacity) in the product name just means its an SD card with memory in the 2GB to 32GB range, and the “SDXC” (eXtreme Capacity) indicates a card with memory in the 64GB to 2TB range. This is a standard convention across all cards. The “UHS-I” (Ultra High Speed, Phase I) is another standard which describes bus design of the internal memory chip interface for two options, for up to 50MB/s (UHS-50) and 104MB/s (UHS-104) data transfer rates. Basically, it means that these memory cards are fast enough to record photos shot in RAW (uncompressed) formats, even if you are using burst mode. Looking at the card, you’ll see the prominent “95 MB/s*” which means the advertised data transfer rate is 95 Mega-bytes / second. The little asterisk means “up to”, since there are a lot of factors affecting how close you get to the theoretical maximum in real world applications. So, Read speeds of up to 95MB/s; Write speeds of up to 90MB/s. Of the cards on this list, the SanDisk Extreme Pro series consistently show the fastest Write and Read transfers. Another major reason why they are a top choice. Using CrystalDiskMark (a disk benchmark software which measure Write and Read speeds) the SanDisk cards performed at 93 MB/s (Read) and 86 MB/s (Write). For photos, the Write speeds are sufficient to handle all formats including RAW, JPEG, compressed in single-shot, sequential-shot and full-burst mode. You can burst about 12 pictures in 12 seconds, or 1 picture per second. Sequential shot will fire off as fast as you can push the shutter button, until your finger gets tired. The Read times are superb for any post-processing work and for off-loading files to storage. The “V30” means if you are doing video on your camera or recorder, these cards can handle all formats including Full HD 1080p (1920×1080), 4K Ultra HD (3840 x 2160) and 3D. The 30 MB/s continuous recording just gets you to the low end of 8K video recording, but we didn’t have any equipment to test how well this works in the real world. The “Speed Class 10” rating on the “Extreme Pro” series guarantees the card has a minimum sustained sequential write speed of least 10 MB/s. However, with the “V30” described above, these deliver more than 3X the minimum. The Video Speed rating is new for SD Cards, so many cards will still show the Speed Class number as well since many photographers look for that specification. A rating of “10” is the highest, and we wouldn’t recommend any cards with lower numbers. Backup / Recovery – The card comes with a RescuePRO Deluxe data recovery software download offer. Just make sure you have the tool downloaded first. This software makes it easy to recover files that have been accidentally deleted. Warranty – A final thought on the SanDisk is that it includes a lifetime limited warranty, which covers the SD card as long as it wasn’t used improperly. You even get the little plastic “jewel case” for storage and carrying around. No extra charge! Reliability – Transcend is a major brand with excellent quality ratings. After many thousands of photos and hours of videos, these cards continue to work the same as when they came out of the package. Looking at reviews on purchasing sites, customers have not had any reliability complaints which warrant concern with using these for your vacations and other can’t miss photo opportunities. Durability – With solid construction, these SD cards don’t chip, crack or break with the usual amount of dropping or getting tossed around in the bottom of a bag with an assorted collection of pens, chargers and other everyday items. The Operating Temperature is -13°F to 185°F (-25°C to 85°C), the same as SanDisk. Write / Read – The red print under the Transcend label has the advertised data transfer rates: 95 MB/s for Read and 60 MB/s for Write. These cards are labeled as: SDXC, UHS-3, Speed Class 10. While there is no newer Video Speed “V30” rating on the label, the UHS-3 guarantees the same minimum 30 MB/s sustained data transfer rate. Similar to the SanDisk, these cards will support data rates for all formats of photos including RAW / uncompressed, JPG, etc. It’s fast enough for rapid-fire single shot and burst modes. For video, it’ll capture both Full HD 1080p (1920×1080) and 4K Ultra HD (3840 x 2160). Running CrystalDiskMark (a disk benchmark software which measure Write and Read speeds), Write speeds came in at 65 MB/s and Read speeds at 93 MB/s. Comparing this with the SanDisk cards (86 MB/s Write, 93 MB/s Read), the Transcend is about 25% slower Writing, and the same for Reading. For actual usage in a camera or video recorder, performance turns out to be pretty much the same – bursting 11 photos in 12 seconds, and as many single shots in a row as you can press the shutter button. Backup / Recovery – Exclusive RecoveRx photo recovery software. This user-friendly application allows you to conduct an in-depth search within your storage device for traces of erased files to be recovered. Warranty – Same lifetime limited warranty as SanDisk. Our second-runner up is the “Professional 633x” series of SD Memory cards from Lexar. The Write and Read speeds are comparable to SanDisk and Transcend, as are the spot prices (see below for links to Amazon for more information or purchasing). Lexar is not as well know to most people, even though they have been in the memory business for over 20 years. Performance, Reliability and Durability are excellent for Lexar, and these are great alternatives to both the SanDisk and Transcend. All memory cards come with a limited lifetime warranty as well as the downloadable “Image Rescue 5” software to recover most photo and select video files. As the third-runner up, we’ll keep this brief: The Elite Performance Memory Cards from PNY are solid, stable SD. We like the PNY since they are usually the least expensive compared with SanDisk and Transcend. However, these are also the slowest of the three manufacturers with Write at 57 MB/s and Read at 93 MB/s. They also do not come with file recovery programs, which is something to consider if you are prone to accidentally deleting files (note that you can find 3rd party software or send to / pay a recovery center as a last resort). We recommend these for your everyday type applications, just make sure to back-up frequently. To complete the list, we include a few SD Memory Cards from Polaroid and Kingston. Both companies make excellent products, and will do nicely especially if that’s all that’s available (if you are traveling, at the hotel gift shop or on the cruise ship). You can use these with confidence. That’s it for now on the reviews for the best SD Flash Memory Cards. If you want to delve deeper into the technology, terminology and background on these products, look for our upcoming article “What Are SD Flash Memory Cards – A Guide To Understanding Classes, Speeds and More”. We will also be going in-depth for some variations on SD cards that we didn’t have room for in this review: Best High Speed Cards, Highest Density Cards, Least Expensive SD Cards, Best SD Cards For Video, and more.